The Type 1 bigfoot, A.K.A. The Patty-type. This is the classic Sasquatch. 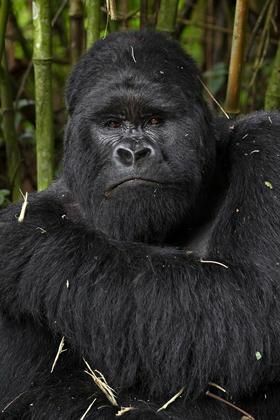 It looks like a cross between a human and a Mountain gorilla (link) It has a large, powerful build, and thick, broad chest. Usually reported with black hair and gray skin. Other hair colors reported are cinnamon, and occasionally white. The head, though massive, has been described as relatively small for the body. Type 1s sometimes develop a sagittal crest which can look like a person wearing a hoodie. They have a conspicuous brow ridge with a receding forehead, giving the eyes a deep-set look. The eyes are hard to see but have been reported to be proportionately further apart than a human’s eyes. Type 1s have a flat face with prominent cheekbones. A square jaw. The mouth region is only slightly protuberant. The nose is near human in shape, though “pug” or flat, sometimes with forward-directed nostrils. The height average for the sampled population is 7’ 10, however, alpha males have been reported at 9′ and larger. The average Type 1 is estimated to weigh 650 lbs.